Bang on a Can cofounder turns to hammering on wood with blissfully minimalist results. 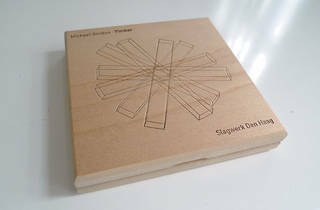 Music collectors are suckers for creative album packaging, and with Timber, composer Michael Gordon has a winner. It comes entombed in medium-density fiberboard, laser-etched with a starburst of 3-D planks. Thankfully, the Bang on a Can cofounder’s latest is as musically compelling as its mantel-ready wooden case. 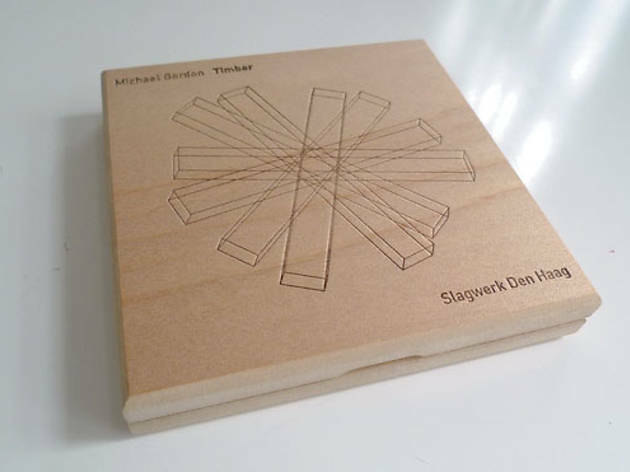 A collaboration with Dutch percussion outfit Slagwerk Den Haag, Timber began with Gordon meeting the group in Amsterdam to select instruments for the endeavor. No easy feat when you consider the sheer number of possibilities. Two-by-fours, or more precisely “simantras” were the choice, and the entirety of the album features Slagwerk’s mallet-wielders striking six boards. The glorious overtones produced from this limited array has to be heard to be believed. A spine-tingling shimmer caroms from east to west in the listener’s headphones. Sound technicianSem de Jongh’s capture of these otherworldly sonic layerings is a bitof recording genius. The sextet breathes these polyryhthms in and out of existence with subtlety, losing itself in ripples of the space-time continuum. In the liner notes, Gordon describes his artistic intent as akin to shamanist author Carlos Castaneda’s pilgrimage into the desert, wiping the brain clear to “bring on visions.” Minimalist compositions tend to have that effect, but it’s been ages since we’ve blissfully zoned out to such a degree.